This book was voted novel of the year by Women of Faith. The message of the book it great, especially since we live in such a materialistic society where people believe that the objects that they own are what define them as a person. This novel opens both your heart and mind as to how it really should be. Although I didn't find the writing to be great (definitely not to be categorized as novel of the year), the message was. Overall, it was a good read. I made myself finish this book, though I nearly gave up on it several times. I certainly would have abandoned it if I hadn't been sequestered in a mountain cabin with nothing else to read. The main character of this story struggles to "be good" and "live like Jesus." Her self reflections take her back to the mean things she did in high school and she is now determined to redeem herself. She goes on an incredible (as in not believable) journey to find and ask forgiveness of the high school classmate she bullied. This journey involves traveling to a far-away state, finding a wilderness guide, taking a two day canoe trip, camping overnight, and overcoming the dread of having to pee in the woods. And then, if this isn't silly enough, there is the big shoot out at the homeless shelter where she volunteers. There are a lot of characters in this book who I can barely relate to, including the main character.This book won a "Women of Faith" award for best fiction a couple of years ago, so I'm either out of step or there were lean pickings that year. Heather Curridge has it all: A great family, ritzy lake-front house, possessions aplenty, and enough money to buy more "things" whenever she wants. Her husband is a surgeon, her son goes to a private school. This is the perfect life, what many people aspire to have but never achieve. Heather loves her stuff, she knows she is fortunate...but then why is she feeling so discontent? Shouldn't she be content with her pampered life? And why have the sins of her childhood started to haunt her?Many people have said this book is life-changing, and I can certainly see how it could be. It did cause me to look around at my possessions, and it effectively and truthfully gets the message across that "things" can't and won't fulfill us....and that is a message we often need reminding of. I did find the story kind of slow in spots, especially in the beginning, but it did pick up. Overall, this is a fairly interesting/entertaining book, with the added bonus of a good message! I give this book 3.75 stars, although I can't bring myself to round up to the four-star rating. First of all, 401 pages was WAY too long. The story could have effectively been told in 300. Secondly, I think part of my let-down is because it was one of Publishers Weekly's Top Books of 2007 and the Women of Faith Novel of the Year that same year, so I totally expected it to be phenomenal. While I enjoyed the ending immensely, the rest went in spurts ranging from sweet to dragging. Overall, it was a nice story of finding faith, embracing diversity, and the American cliche of discovering what's truly important in life. The story drives home the inner battle of being able to accept that a life of less is more, putting material posessions aside in exchange for simplicity, and a love of God. I have already bought two more of Samson's books, so I will give them a fair shot before making a final determination as to whether to keep reading her works. What I liked:I liked the overall concept of the plot and main character (Heather). Heather is a wife to a cardiac surgeon. They have a son and she is a stay at home mom. They have plenty of money, which is mostly spent on crap they don't need. She spends money to buy STUFF as a way to fill a void she seems to have in life. After a lifetime of trying to fill that void, she realizes she cant do it with material possessions or social status.What I disliked:The constant conversations she had with everyone else about the problems in her mind. It seemed like every few pages she had the exact conversation with her friends or husband or son. I got sick of that. If I were the main character's friend in this book, I would avoid her at all costs because she would annoy the hell out of me. Wow, I can see why this book was Christianity Today's 2008 Novel of the Year. This book took me a while to get through, but not because of the content, but other things going on (relative in hospital, company at our house, etc). I think I would have flown through this book if I had my "normal" time to read.It is taking me a while to digest this book. I don't think I can give it a review that will do it justice. I enjoyed it. I found it choppy in writing style, but riveting. I found it challenging. Thought-provoking. A recommended read, to be sure. Heather has everything, and she's not happy. She knows she should be happy -- she compulsively buys name brand everything, she's got a great family, lives in a a great neighborhood -- but she isn't.For most of the book I thought Heather needed to get over herself and go do something useful. She eventually came to that conclusion herself. What I did enjoy was her and her supporting characters' description of how God does not work in the ways we expect, and sometimes when we are most troubled that's when he's most active. That rings true to me. I want to start by saying that this book has a lot of good messages, and I agree with almost everything that it says. Social justice, peace, and care for the poor and downtrodden are at the heart of the gospel, and after having avoided Christian fiction for years (after reading a lot of it in high school), I'm glad that a successful Christian novelist is critiquing the prosperity gospel, middle-class satisfaction, and smugness of the evangelical Christian Right. That being said, while this book works well as a sermon, it doesn't work at all as a novel. None of these people feel at all real; they're plot-serving cliches at worst, and two-dimensional at best. The most vibrant characters in the novel are the two elderly sisters, and even they are too wise, too perfect in their ability to dish out a pithy opinion or impossibly sage Bible-based advice at the drop of a hat. The protagonist especially didn't seem like a real person at all, with her folksy expressions, on-the-nose explanations of her thoughts and feelings, and weird asides (why all the little jabs at feminism and liberals?) It's possible that I, a 24-year-old liberal graduate student, am too far removed from the main characters in this book for them to ring true to life. And yet - everyone felt like they were introduced to teach a lesson, to illustrate a point. I read a lot of novels about people with viewpoints far different from my own, and yet they still feel like *people. * Heather Curridge feels more like the character equivalent of a faux-wood Live, Laugh, Love sign. There were moments when the writing was effective, when I felt myself wanting to learn more or delve more into a scene. But for the most part, the book didn't know when to linger and when to move on. Promising scenes and conversations were abruptly cut short in favor of another lunch, another phone call with Heather's indistinguishable lady friends (all of whom dispensed perfect wisdom). Other conversations and symbols were dwelt upon far longer than they should have been - Heather would identify a symbol, and then explain what it meant, relate it to a couple events happening at the moment, and then reinforce what it meant to her. That much explanation greatly weakens writing's power. Revisiting a Christian novel for the first time in a long time, I am struck by Christian art's fear of subtlety. Because Christian art is often conceived not primarily as a project in and of itself, but rather as a vehicle to reach people, creators - whether they're filmmakers, novelists, or musicians - are afraid of people missing the point. Instead of trusting the reader/viewer to understand what they're saying, they make themselves painfully, explicitly, anvil-droppingly clear. The result, unfortunately, is that the messages can be alienating; as a reader you can feel talked down to, like you set out to read a story and were tricked into going to a lecture instead. All that being said, however, this book's message is a very good one, and if there's someone in your life who eagerly consumes Christian fiction, this would be a good entry in the genre to add to their reading list. This fascinated me, because it is an evangelical story written with a very modern day problem type of angle, a real 'third world problem' kind of story. Heather is unhappy—and she doesn't know why, but everything she tries to do to make her happy again doesn't work. She buys things, volunteers at the 'rich people school' with other unhappy people, and can't find satisfaction in anything.When a kangaroo wanders across her path, and she coats the inside of her car with chocolate cake, she realizes that it's time to make a change. After spending a few weeks with the sisters, she understands what has been missing in her life—and works to make the change, and help others see the same thing. Heather seems to have it all. A great husband, a loving son, and all the stuff she can fit into her big house. However it isn't enough. Heather feels she has much to answer for, including bullying behavior as a young person. She also realizes that she does not want to continue down her current path of consumerism. Heather needs to find a new way and, with the help of 3 new friends, her loving family, and several others, she does. Christian fiction at its best. It was a good story but took nearly 250 pages to actually get really into it and then it was just the last 60 pages or so. I can see why some might like the story line of someone figuring out how to live for Jesus in our modern society of gotta have more. Just didn't capture me til almost the end. I almost never give a 5 star rating even if I really enjoyed the book. But this one deserves it. Mostly I read for entertainment, but this book went beyond that, right into speaking deeply and causing change. I've read this book three times. Lisa's writing is remarkable. The main character, Heather, has a quirky, relatable voice. The novel is poignant, timeless, challenging ... and may change your life. One of my favorite books of all time. Want to learn how to let go of material possessions and recognize whats really important, try this book on for size. I almost closed the book without finishing it several times and yet something compelled me to go on reading to the end and yes, in the end, I did end up at least liking parts of the book.What first threw me off was the main character Heather (nicknamed Hezzie???) was a hot mess. Once having dreams of opening a hair salon, she instead gave up a career when her husband became a successful (think dollar signs) heart surgeon. At a loss of what to do to fill the emptiness in her life, she becomes an over-eater, over-spender, and over-extender of her time at her only child's school. Oh, and she bakes fabulous cakes too. She is also disillusioned with church in general and more specifically with God's presence in the world as she sees it. Honestly, Hezzie made my head spin and I wanted to take her aside and give her a good talking to as she keeps trying to keep up with Jones's which is one of the reasons why she left the church that she felt only cared about outward appearances and not actual acts of God's teachings.In the end, Hezzie finds a fulfillment and sense of purpose by volunteering at a shelter run by Sister Jerusha in a run-down, poverty and crime-stricken area of the city. It was actually that introduction of Sister Jerusha that kept me reading. An elderly, crusty, and energetic nun who happens to be the godmother of a known drug dealer kept me laughing with her phrases like "Frish! You got it doll. "But on her journey Hezzie meets two sisters who may or may not be Quakers, but who believe in goodness and in doing good and as she spends a great deal of time with them to sort things out, she begins to come to some revelations about faith and God's presence. 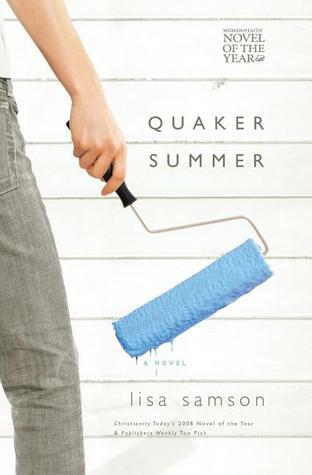 On that note, the title Quaker Summer what misleading since the book was not about an entire summer living the Quaker life that I thought it would be.Now...there is also the side trip to a camp in Minnesota in the fall that Hezzie goes to with her elderly neighbor Jolly. The drive to Minnesota and spend two days paddling to (and then two days back from) a remote campsite to visit a man that Hezzie needs to find to finally, finally rid her conscience of a terrible thing she did in her childhood. Yes, another drama in Hezzie's life that had me reeling.With the help of her very rich friend Lark, Hezzie finds her way out of her confused and depressed state and to help Sister Jerusha fund the shelter that is so badly needed, and all ends well (after a dramatic event at the shelter) as she plans to sail off in the sunset with her husband who has grown tired of making money only for Hezzie to spend) on a hospital ship to do more good. I loved all the crusty characters in the book and the wisdom and humor and life experience that they brought to the plot. Any one of Hezzie's issues and any one of the crusty characters to help tell her story would have been enough and for me, more believable. So many things going on this book; so many characters; so many implausible events just made this book too over the top for me...and yet, "Frish! I just had to love Sister Jerusha. What a doll. What a doll. "Note: For readers looking to more believable Christian fiction, I would recommend Neta Jackson. She writes it "real". I decided to finish this after all, since my brain was spinning after finishing The Black Hole Wars. This is a treacly-easy read that hasn't gotten any better, but for whatever reason I decided I might as well just see it through. The characters have all the depth of the manufactured stock people from the management books, only the insights shared through them aren't anything remotely novel. The incredibly wealthy bored suburbanite housewife and her even wealthier friends aren't satisfied with all their material things, and the central character (Heather) needs something spiritual to fill the gap. Yeah, got it. Without the book's drivel of a non-plot. What's really irritating is the portrayal of Quakers when they finally appear halfway into the novel. The two Quaker sisters have a dog named Oatmeal, in homage to Quaker Oatmeal, with no hint that the author's remotely aware that Quaker Oatmeal wasn't founded or owned by Friends, and has in fact irritated a great many Quakers by its insistence on using us as a mascot. When Heather finally visits a meeting, she attends Sunday School--NOT First Day School, incidentally--and the topic under discussion is ... get ready ..."Campaign finance reform, clean and verifiable voting procedures, global warming and fossil fuel dependence, opposition of the doctrine of preventative war, immigration, living wages, and poor working conditions. Defense of the rule of law by limits on executive power ... Health care ... AIDS here and abroad ... National security: diplomatic versus military solutions ..."I kid you not. How long is this meeting's adult discussion time, anyway?? ?For that matter, these Friends (who don't call one another Friends) attend an unprogrammed meeting probably in BYM, from the description, but their perspective sounds like it would be more at home in a conservative programmed meeting in Iowa.Never mind the rest for now. I could fill a few screens with the rest of the "just don't fit" characterizations of Quakers, but I won't bother right now. Basically, the author appears to have only a passing acquaintance with Friends--perhaps no personal acquaintance at all--and I'd be surprised to hear she'd visited a single meeting, stunned to hear she'd attended more than one worship group or even visited the same one more than once.Blech. Heather is suburban mom who looks like she's got everything you'd want. She has a lakeside dream home, and enough money from her surgeon-husband's salary to finance private Christian school for her son, make continual upgrades to their home, and go on regular compulsive buying fits. Her husband adores her even though she sees her extra weight as a turn-off. She's also caught up in the loop of keeping appearances with the other moms at school. Her teenaged son, Will, has problems with being teased at school over his own awkwardness, which causes Heather to reflect on her past as a bully in elementary school. all these things, along with her other bad driving habits, put her on a path to radical change. This book isn't meant to make you feel guilt-tripped into making changes, but will probably resonate with you on one level or another. What suburban Christian mom hasn't wondered if they were missing God's call? Is the Christian life really about acquiring the finest household items, raising our children in a protected environment, and settling into a local church with the best programs for our families? Or is there something else out there? How do we deal with our broken dreams and guilt over the past? How do we move forward from where we are now and how do we listen to God when we sense our paradigms shifting beneath us? I think this book gives you permission to begin looking at these issues in our own lives without thinking we are going crazy in the process. If you are from a fundamentalist Christian background, you probably will be uncomfortable with the ecumenicalism and somewhat feminist perspective. Heather has a friend who holds a pastoral degree, and she asks her to conduct the service of a newly formed house church. The main character also volunteers at a Catholic inner-city mission. Yet I think you will still appreciate Heather's desire to live a more Christlike life in seeking and extending forgiveness, as well as giving up comfort for the sake of the Gospel. Randomly picked this up at the library the other week. It is part of Thomas Nelson Publishers' "Women of Faith" fiction series. Of course, the "Quaker" in the title grabbed me. Then I noticed reviews saying that it spoke to our culture's addiction to consumerism, and talked about the radical gospel of Christ. Then I opened it and saw the chapter titles are titles of Beatles songs. SOLD.I'm finding myself reading more and more women's Christian fiction these days. It's surprisingly good.Samson is a wonderful writer. Let me share with you this sentence I read last night, and really spoke to me:"Nobody told me how precious dreams of the dead become, how our own subconscious somehow gifts us with the time and sapce to once again be with those who have left us behind."Wow. She perfectly articulated something so true for me. I dream about my dad, my aunt, and my great-aunt all the time. And it is a gift because it allows me to be with them again. And I always wake up sad and disappointed that they have been left behind in my memories and my dreams. As one of my favorite hymns says, "Death like a narrow sea/divides that heavenly land from ours. "A bonus is that this book is set in Baltimore! And it's real. The protagonist lives near Loch Raven Reservoir in a nice big suburban home. She goes into the city (via the Jones Falls Expressway) and meets an urban activist Catholic Worker nun. I am only on p. 38 and can say without a doubt, this book is totally up my alley. ********************************************************This book was surprisingly good. It rose above the level of just throw-away chick lit, in that it dealt with real issues of faith, doubt, and discerning "leadings" as Quakers put it. It actually had quite an impact on me spiritually, leading me to re-examine my own leadings and what I am doing as a Christian to touch people's lives in a real way. It was a very real book. I also enjoyed the many references to Baltimore neighborhoods & streets. Not being a typical American Christian myself, I tend to regard Christian fiction with skepticism. Lisa Samson's novels are an exception, as they feature more complex characters and "edgier" plots that most typical Christian fiction. In this novel, Heather, a middle-aged stay-at-home mother, experiences a painful spiritual awakening. Heather is like most of the women that I knew growing up. She married young and sacrificed many of her own hopes, dreams, and ambitions upon the altar of good Christian motherhood. in Heather's case, she gave up her dreams of opening her own salon so she could stay at home with her son. When the novel opens, Heather spends most of her day driving around town aimlessly for hours, and filling her house with white comforters and white china while she is terrorized by the "Queen Bees" of her son's exclusive prep school. As part of her spiritual awakening, she seeks forgiveness for childhood sins, becomes more involved in social justice work, and embraces a less materialistic and consumer-driven lifestyle. Lisa Samson is a clear proponent of social justice, but does not sugar-coat any of Heather's new work or assume that Heather is in any way saving the world. I would particularly recommend this novel for book clubs and other reading groups, as it is a wonderful novel to prompt conversation about a variety of spiritual and non-spiritual topics. p. 173The Friends Peace Testimony"We utterly deny all outward wars and strife and fightings with outward weapons, for any end or under any pretence whatsoever. And this is our testimony to the whole world. "From "A Declaration to Charles II", 1660p. 220"Of course my nose has started to run, and every sniff sounds like the winds of a hurricane here in the silent gathering. Most sit with their eyes closed, expecting a thought from God or waiting for someone else to stand and deliver the Spirit's message. At least that's what their literature says they're doing. Me, I'm just looking around, breathing foreign air, and wondering what they'd do if I stood up and shouted "Praise the Lord and pass the ammunition! ""My shoulders start to shake with laughter..."My mum has recently ordered a t-shirt that says "God, Guns and p. 230""I'm a nomad Christian, Heather. """But what about finding a church home? """I have a church home, with the men at the halfway house. """Is it the same? """We are all God's people, Heather. My church is THE church. I don't have many years left and want to be with as many of God's people as I can. ""I like that. A nomad Christian.p.313"See, it's like this. When God shows up you never know what form he's going to take. But when it's Him, if you're at all awake, you know it. "Here's to hoping I'm awake enough. I got off to a slow start with this book. The main character was hard for me to feel 'connected' with. I couldn't relate to or understand her compulsion to keep buying things to make herself feel better. But as her heart was softened and she began to grow closer to God, I really began to love her! Here's the paragraph that really hit me:"And when I cut away the rot from a case of oozing tomatoes that came from only heaven knows where, I experienced euphoria like I'd never known. I knew that at that moment I was doing the holy will of God. I was exactly where I was supposed to be; it was holy and good and just. Merciful--to me, the chief of sinners--and humbling. I shouldn't have been privy to such blessing, such favor from God as to serve right there, right then. He called me out to do this, and I deserved non of it. I could have been in my house at this moment, sitting on my plush couch with a cup of warm tea, a Bible in my lap, and a study book beside me begging God to make me whole while doing none of His dirty work. But no. I cut rot off tomatoes in a roach-infested kitchen off North Avenue. "This author definitely challenges my comfort zone.....but in a good way. For me, I need to be reminded that I am to be living out my faith and my love for God. It's not just about studying the Bible, but about applying it! I find it difficult to say whether this book is 'good' or not, since I'm not much of a literature fanatic and I don't care so much about stylistic considerations. Obviously the opinions about this book vary widely. I can see that the critics have some good points, but regardless, I enjoyed the book pretty much. The many silly conversations and random observations about American culture (especially about evangelical subculture) make for an easy and entertaining read, while the deeper questions and problems faced by the main character also make you think about yourself and your own life (at least, they did for me).I fail to see the point of those saying that it's unrealistic for the main characters to think and talk about Jesus or theology the way they do. Sure there are plenty of Christians who don't do this a lot, or so-called Christians who couldn't care less, and that is actually half the point of the book... But just as surely there are those who want to think and talk about it and what it really means in their life. Especially since the main character is having sort of an identity crisis, it only seems logical to me that she is pondering these questions.Anyway, a nice summer read. Lisa Samson has quickly become one of my all-time favorite authors. In this 2007 Women of Faith Novel of the Year and Christy Award finalist, Heather, the main character, is a well-to-do shopaholic with a terrific kid and married to a handsome surgeon who is nuts about her. She lives in a house that most people only dream of, furnished with the best of everything. On the surface, life is grand. But are all the ‘things’ merely anesthetic for a pain too deep to be faced? In order to find the peace to move ahead, she must confront her own shameful past. To do that, she finds help from some unlikely sources – among them a nun, and a couple of ancient Quaker women.Quaker Summer is one of those books that captivates you so deeply and draws you into the story so masterfully that you can’t put it down. It changed the way I think – about a lot of things. It’s beautifully written, and full of so much wisdom I wanted to grab my highlighter as I read. I challenge you to read this book and not come away changed. It’s never preachy (if you know me, you know I detest preachy books), but the message is powerful and profound. Samson spins a wonderful tale with strength and skill. Sometimes, a decent book is made really good by a theme and story that connect with the circumstances of the reader's life at that moment in time. For example, when I read "Eat Pray Love" by Elizabeth Gilbert for the first time, I have no doubt that I appreciated it so much more because I was recently divorced and could relate so much more intimately to the things she wrote about. Reading this book, I had the same type of appreciation. I'm at a point in life where I really relate to the doubt and inner turmoil that the main character is experiencing in her faith. That doesn't mean I wouldn't have liked the book had I read it some other time. But reading it now - in this week - there were passages that touched my heart and left an impact much stronger than may have happened otherwise.All in all, it's a lovely story about one woman's effort to make her corner of the world more genuine and real. To me, the best factor in this book is main character Heather's struggle to connect and hear God in the midst of attempts find joy through material wealth. Good portrayal of societal values, but I thought it was naive in some ways; However, that naïveté epitomizes the main character, who actually develops a greater sense of purpose by attempting to love, work (volunteer) in some very accurately portrayed poverty & violence. The only negative for me is that I think few people are actually have the luxury of volunteering & choosing how to help. For myself, it seems a lot harder to volunteer & do good when you're not financed by a surgeon husband, you're busy trying to survive yourself... May we all have the blessings of being able to serve God in our own capacity...worth the read, but again, hard for me to connect due to Hezzie's economic status. Heather is losing it...she thinks she has to be the perfect wife, perfect mom, have the perfect house, and be the perfect Christian. People come into her world that help her realize that life is about so much more than THINGS and that Jesus really just wants your time, not your money(the church wants this!). I grew up without religion or faith playing a role in my life and as an adult, I've found that I have been searching for something and have been struggling with "what" that exactly may be. This book really gave me a lot of food for thought and instantly brought to mind, Sheila (Book Journey) who is always giving of her time to those less fortunate. I think this is where you find Jesus....helping others help themselves, not by throwing money at the problem. For those that enjoy Christian fiction, read this! Heather, the main character, and I are living very similar lives. At least when it comes to spiritual lives. Her journey spiritually in this book is very similar to mine the past few years. It was refreshing to read someone else questioning the same things I question. I realize it is fiction but there's reality underneath the fiction. Again, Lisa Samson hits a home run. She faces life head on and doesn't cloak it with "isms" and such. So refreshing! The journey in this book is "simply" this: what happens when faith doesn't fit in the pew any longer and suddenly the church sanctuary feels suffocating? What would Jesus do? This book, while fiction, goes a long way in exploring the answer to those questions. I really really loved this book!